12h00 for 12h30 – 15h30 Albertvale Farm. Tasting lunch and Cook’s Garden masterclass incl growing edibles, garden tour of useful plants, picking from the garden, seasonal cooking. R250 pp. Book with Kim: gecko@eastcape.net 082 775 5178 Garden available for early viewing if required. 17h30 - Cocktail Party, speaker: Keith Kirsten. Meet at the SA Rosarium, then move to the Old Gaol at 18h30. This is a Rosarium fundraiser with substantial snacks. Book gecko@eastcape.net. Early bird R80, at the door R100. 7h30 Sunrise Yoga at Albertvale Retreat Centre with Kim. R80. 8h00 Breakfast served at Eagle Hout, The Apprentice, The Duke of Bedford Inn, and The Village Farmstall. 8h00-17h00 Opening hours for gardens, farm visits, plant nurseries, art exhibitions (Albertvale and De Klerksdal farms and Art Lab in Hope Street etc) and Atlantic Homeground garden lifestyle fair @The Duke. You are welcome to linger at Lynedoch but note that refreshments and tours will only be offered there on Sat. Norwood opens from 16h00 for sundowners & sosaties. 9h00 Tea and coffee at the Country Market, The Apprentice, The Duke Courtyard, Munchies, Eagle Hout Padstal, The Village Farm Stall, The Mill, Cavers, Donkerhoek, Belmont, Skelmkloof and De Klerksdal farms, Midgleys Hotel and The Stoep (Adelaide). 9h00-12h00 Albertvale Farm. Cook’s Garden Masterclass with tastings (details and booking as for Thursday). 9h00-17h00 Flowers & quilts, Presbyterian Church. 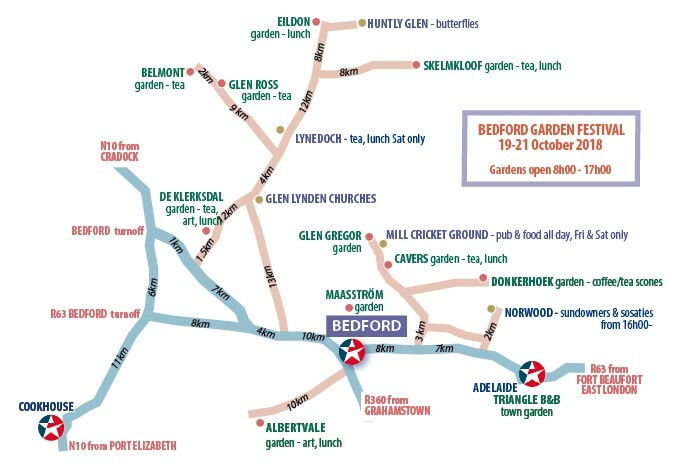 LUNCH: Eildon, De Klerksdal, Skelmkloof, Albertvale, Cavers, The Mill Cricket Ground plus the same town venues as tea. NB NO LUNCH at LYNEDOCH TODAY. 14h00 BUTTERFLY TALK by Ernest Pringle at Huntly Glen. 14h30 GARDEN walkABOUT with Kim van Niekerk @Albertvale farm. Cost included in gate fee. 16h00-17h00 GUIDED HISTORY WALK: town and graveyard. Hear some of the stories, view buildings and places of historic interest. Free; meet at the Bedford Club. 16h00 BUTTERFLY TALK by Ernest Pringle at Huntly Glen farm. View his renowned collection. 18h00 HOPE STREET SOIRÉE Dancing in the street with live music, tapas-style street food and/or seated dining, bar service, shops all open. NB Booking essential for The Butcherbird, The Duke of Bedford Inn restaurant and The Apprentice. 8h00-17h00 Opening hours for gardens, farm visits, plant nurseries, exhibitions (Albertvale and De Klerksdal farms and Art Lab in Hope Street etc) and Atlantic Homeground garden lifestyle fair at The Duke. Norwood opens from 16h00 for sundowners & sosaties. 8h00-17h00 SPECIAL PROGRAMME at LYNEDOCH FARM (082 655 1166) Entry: free. Guided tours to the graveyard between 09h00-15h00, as well as a 5 minute video of the farm. You may buy tea/coffee/cold drinks, sosaties, vetkoek (curry/sweet) throughout the day on Sat. Game drives on request. 8h00 BOOKING CLOSED Tanya Visser Breakfast Show hosted by Atlantic Fertilisers at The Duke of Bedford Inn. 9h00-17h00 Country Market , NGK grounds. 9h00 Tea & coffee - the same as on Friday PLUS Lynedoch Farm is also serving today. 9h00 The Bedford Country School Bat Mini-Cricket Festival at The Mill Cricket Ground. 10h00 BUTTERFLY TALK by Ernest Pringle at Huntly Glen farm. View his renowned collection. 10h00 GARDEN walkABOUT with Kim van Niekerk @Albertvale farm. Cost included in gate fee. 12h00 BUTTERFLY TALK by Ernest Pringle at Huntly Glen Farm. View his renowned collection. 12h00 GOLF - visitors welcome to play. LUNCH: Same as Fri PLUS Lynedoch Farm - ALL DAY Sat only. 14h00 BUTTERFLY TALK by Ernest Pringle at Huntly Glen farm. View his renowned collection. 15h00 GARDEN WALKABOUT with Kim van Niekerk @Albertvale farm. Cost included in gate fee. 15h00 TEMPLETON CHOIR performs in the NGK. 8:00-17:00 Opening hours for gardens, farm visits, plant nurseries, exhibitions (Albertvale and De Klerksdal farms and Art Lab in Hope Street etc) and Atlantic Homeground garden lifestyle fair at The Duke. You are welcome to linger at Lynedoch but no refreshments or tours will be offered here today. Norwood opens from 16h00 for sundowners & sosaties. NB TOWNSHIP GARDENS ARE CLOSED TODAY. 9h00-13h00 Country Market, NGK grounds. 9h00 Tea & coffee at the Country Market, The Apprentice, The Duke Courtyard, Eagle Hout Padstal, The Village Farm Stall, Munchies, The Mill, Donkerhoek, Cavers, De Klerksdal, Skelmkloof and Belmont farms. 10h00-13h00 Flowers & quilts, Presbyterian Church. 10h00 BUTTERFLY TALK by Ernest Pringle at Huntly Glen. 11h00-14h30 Pam Golding Properties Concert under the oaks at Cavers farm garden. No booking: pay at the farm gate. From 8h00-10h30 pay R20 (garden entrance only). From 10h30 pay R40 for garden entrance and concert. From 14h30, the gate fee reverts to R20. 12h00 BUTTERFLY TALK by Ernest Pringle at Huntly Glen. LUNCH: The Country Market, The Apprentice, Eagle Hout Padstal, The Village Farmstall, Munchies, plus Cavers, Eildon, Skelmkloof, Albertvale and De Klerksdal farms. NB NO LUNCH at THE MILL or LYNEDOCH TODAY. DINNER/SUPPER: The Duke of Bedford Inn (Advance booking essential 078 511 9689).